There is nothing more exciting for a cheerleader than filling a gym with the roaring approval of crowd chants for basketball. Because of the resonance of echoes in most gyms, getting a crowd going can literally shake the walls. But finding the right chant, and the right times to use it, is one of the skills that good cheerleaders constantly work on. have short, monosyllabic words: "Hey!" "Go!" "Win!" "Yeah!" have rhyming words, when possible (see the above example). Another good idea when coming up with chants for your basketball team is to try and come up with original material, specific to your school and your team and your squad. This really gives a personal touch and a motivational spur to your cheers that the entire crowd should be able to relate to. 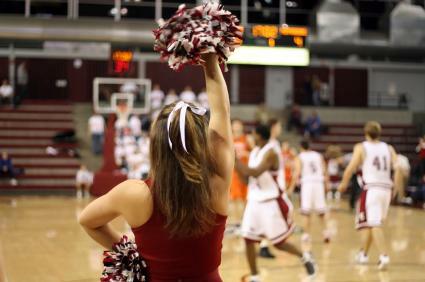 You'll also be more likely to avoid the embarrassment of performing the same cheer as the squad from the opposing team. Besides, coming up with your own cheers and chants is very, very easy, even if you've never done it before. Whatever your team or school name is (assuming it's not too long). ''S (clap-clap) C (clap-clap) O (clap) R (clap) E! Score the way to Vic-to-ry! Notice how in the latter example the last word, even though it has three syllables, is sounded out individually so that it's very easy to hear and remember. It also has hard consonants, which work better in the horrible acoustics of a gymnasium. Hey Spartan fans (or whatever the school mascot is) Lemme hear you shout! Shout it out, what we're all about! Crowd yells FIGHT, SPARTANS, FIGHT! Crowd yells WIN, SPARTANS, WIN! Spend the time before the game coming up with the variations that you're going to teach the crowd, but don't hesitate to use the inspiration of the game itself to shape your cheers. If a particular team member has just scored a three pointer, for example, using his or her name instead of the team name will invigorate and encourage the team to do better. Nothing puts heart in a team like having a cheering crowd, and that's what makes the cheerleaders so vital to the sport.